Patagonia. A vast expanse of rugged terrain at nearly the bottom of the world, Patagonia has for years loomed large in my imagination. Nearly inaccessible for much of the year, the region beckons adventure travelers and those — like myself – who are drawn by its breathtaking and formidable beauty. Panorama from 5 vertical shots, additional exposures for highlights, focal length 24 mm, aperture f/11, shutter speed 1/5, ISO 80, tripod. It’s a massive region roughly three times the size of Germany that extends across the southernmost regions of Argentina and Chile. I began my trip in Argentina’s Los Glaciares National Park, more than half of which is covered in glaciers. Here, near the border between the two countries, Mount Fitz Roy towers over the massive ice field. The peak is regarded by climbers as one of the most difficult ascents in the world. It isn’t the great peak’s height that makes it challenging, but the ice and wind that are ever-present, even in good weather. Ancient people referred to the mountain as “Chaltén,” which means “smoking mountain.” They believed the mountain to be a volcano because of the heavy veil of clouds at its peak. 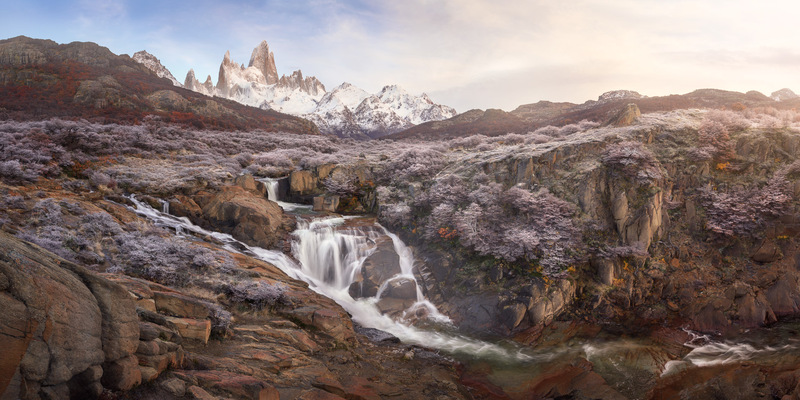 To explore Patagonia at all requires planning and stamina, and photographing Mount Fitz Roy was no different. I wanted to photograph the peak at sunrise, which involved a two-hour hike up a steep path before daylight, a challenge in the best conditions. For two days, it rained, making it too risky to climb the path in the dark. On the third day, the weather improved and I packed my gear and headed out into the Patagonian darkness. I reached my location just at dawn, and gasped at the sight. All of the trees and bushes were dusted with delicate white hoarfrost, and in the early morning light, it glistened like silver and diamonds. It was a magical landscape, and it seemed to me to be a fitting image for Patagonia — a landscape that is challenging and difficult, but one that rewards you with gems of the most incredible beauty. This entry was posted in Landscape and tagged Argentina, Patagonia.